On this playoff edition of Around the Brackets, we’ll recap sub-state semifinal action from Friday night. Blue Valley North 51, Olathe North 49 – Blue Valley North will go back to Emporia to try and defend its 6A crown as the Mustangs held on to defeat Olathe North, 51-49. Graham Mertz completed 32 of his 55 passes for 519 yards and five touchdowns in the victory. The Mustangs and Eagle were tied at 35 when Mertz hit Ammon Thutmosei on a 27-yard touchdown to lead 42-35. Blue Valley North stopped the Eagles, got the ball back, and immediately scored as Mertz hit Amauri Pesek-Hickson on a 38-yard score to lead 49-35. But Olathe North wouldn’t go away. The Eagles scored on one of four touchdowns passes from Arland Bruce, Jr to Elijah Williams to pull within 49-42. Olathe North would force a Mustang punt, but it pinned the Eagles at their own 3-yard line. On the first play, Bruce looked to throw a lateral to a receiver, but the ball slipped and went out of the end zone for a safety to allow Blue Valley North to lead 51-42 with 2:29 left. Bruce and Williams would hook up for their fourth touchdown connection in the closing seconds to pull the Eagles within 51-49. Bruce passed for 174 yards and five touchdowns to go along with his 112 rushing yards. Daymonn Sanchez rushed for 233 yards and a score on 28 attempts for Olathe North. Mertz also added a touchdown run for Blue Valley North, as did Pesek-Hickson. Erik Roberts caught 11 passes for 196 yards and two scores, while Cameron Burt added 129 yards and a touchdown, and Shawn Hendershot had 101 yards on seven catches. Pesek-Hickson also had 81 receiving yards and a score. Derby 24, Manhattan 6 – Derby will play in a fourth straight title game and will rematch versus Blue Valley North after last year’s thriller that North won in the final seconds. Derby defeated Manhattan, 24-6. All of the scoring was done in the first three quarters. Derby led 24-0 at halftime and held Manhattan to 13 total yards and no first downs in the first half. On the very first play of the game, Tre Washington scored on a 67-yard run. Hunter Igo had a five-yard TD run and 36-yard scoring pass. Derby continues to have one of 6A’s best defenses since Prep Power Index started to track teams in 2006 and has permitted just 87 points. Every other 6A team has allowed at least 156. The Panthers remained undefeated at 12-0, and Manhattan finished the season at 10-2. St. Thomas Aquinas 67, Olathe West 21 – Aquinas scored 54 points in the first half in rolling to a 67-21 victory over newcomer Olathe West. Blake Anderson started at quarterback and completed all four of his passes for 119 yards, and added 101 yards and a score on the ground. Cameron Jackson added 91 yards and three scores for the Saints, while Finn Barnett and Charlie Ketchum each rushed for two scores. Quarterback Tate Raboin and running back Tank Young did not play. Wichita Northwest 67, Maize 60 – In another game that more resembled a basketball score, Wichita Northwest defeated Maize, 67-60, a week after an 84-67 victory against Bishop Carroll. Northwest, with its high-octane offenses, has broken through and reached its first state game since 1996 and second in school history. Northwest scored in the final :30 seconds on a 28-yard pass from Reagan Jones to Zion Jones and then had a game-clinching interception from sophomore Todric McGee. Against 5A’s top-ranked defense, Northwest passed for 106 yards and rushed for 643. Maize threw for 521 on 34 of 57 passing with seven touchdowns from Caleb Grill. The Eagles rushed for 138 and Grill served the leading rusher with seven carries for 70 yards. Preven Christon had 12 catches for 234 yards and four TDs. Reagan Jones had a huge game with 30 carries for 279 yards and three scores. Maize committed two turnovers, while Northwest had none. The teams combined for 17 penalties for 190 yards. Northwest led by 19 points entering the fourth quarter but Maize took a 60-59 lead with 2:51 left. Bishop Miege 46, Basehor-Linwood 7 – Bishop Miege advanced to the Class 4A state title game for the fifth consecutive season with a 46-7 win at Basehor-Linwood. The Stags opened the game with a 27-0 lead before the Bobcats score to pull within 27-7 at halftime. Miege then added three scores in the second half to pull away. Sam Pedrotti passed for 245 yards and two touchdowns, and added 30 yards rushing with a pair of scores. Brison Cobbins led the Miege ground game with 110 yards and two scores. Hudson Bentley caught 11 passes for 155 yards and a score, and also threw a 63-yard touchdown pass to Phillippe Wesley. The Stag defense shut down the Basehor-Linwood running game in limiting the Bobcats to 4 rushing yards on 18 attempts. Basehor quarterback Dylan Mussett passed for 130 yards and a touchdown in the game. Goddard 15, McPherson 14 – Goddard beat undefeated McPherson, 15-14, on the road and moved into the Class 4A state title game. The Bullpups had enjoyed massive margins of victory and multiple offensive school records against 4A’s easiest schedule. Goddard had faced much more resistance, lost twice, but had one of 4A’s top-five defenses. With 25 seconds left, McPherson’s Kyler Hoppes threw to the end zone but the pass was tipped up in the air, and Goddard made a diving catch for the interception. McPherson led 14-9 with 4:29 left in the game when Ben Bannister scored to give Goddard the lead. Bannister had both scores for Goddard as the Lions came back for the second straight week. McPherson led 14-9 with 3:03 left in the third quarter but Goddard blocked a field goal. McPherson led 14-7 at halftime. The Lions moved to 14-9 on a safety from a bad snap by the center with 9:06 left in the third quarter. Goddard is 10-2 and in its second state game in three years after a runner-up to Mill Valley in 5A in 2016. McPherson fell in the sub-state title game for the second straight fall and ended 11-1. Sabetha 21, Galena 0 – Sabetha used a strong defensive effort to shutout Galena, 21-0, and advance back to the Class 3A state championship game in Hutchinson. The Blue Jays and Bulldogs battled through a scoreless first quarter until Joe Gruber scored on a 9-yard run for a 7-0 lead. The Blue Jays then tacked on a Gabe Garber 3-yard run in the closing seconds of the first half to lead 14-0. Galena threatened a couple of times in the second half only to be stopped on downs inside the Sabetha 10-yard line. Gruber led Sabetha with 115 yards on the ground and two scores, while J.C. Shelton led the Bulldogs with 72 yards rushing and 64 passing. Sabetha, the defending Class 3A champions, have now won 19 consecutive games. Pratt 21, Andale 19 – In a wild contest with much of the scoring late in the fourth quarter, Pratt defeated Andale, 21-19, in a battle of two undefeated teams. Andale was No. 1 since the preseason. Pratt is in its second state title game in three years after the Class 4A, Division II crown two years ago. Andale opened the scoring with a five-yard touchdown run and a 7-0 lead with 5:22 left in the first quarter. Travis Theis tied the game with a 15-yard run with 3:23 remaining in the third quarter. In the fourth, Theis, with more than 2,200 rushing yards this season, broke a 96-yard touchdown run 18 seconds into the fourth quarter. Andale scored on a four-yard run to cut the deficit to 14-13 with 5:23 left but missed the conversion. Theis responded with a seven-yard touchdown score with 2:24 left in the contest. Andale scored on a five-yard touchdown pass but the two-point conversion was unsuccessful with 39 seconds left in the contest. Additionally, the Riner brothers are back in the state finals for the second time in three years. Current Pratt standout Kadence Riner is the youngest of six brothers. His oldest brother, Cullen, served as the Osborne head coach on the 13-0 squad two seasons ago and is currently the Osborne assistant coach. Osborne will represent the West at state in Division II. 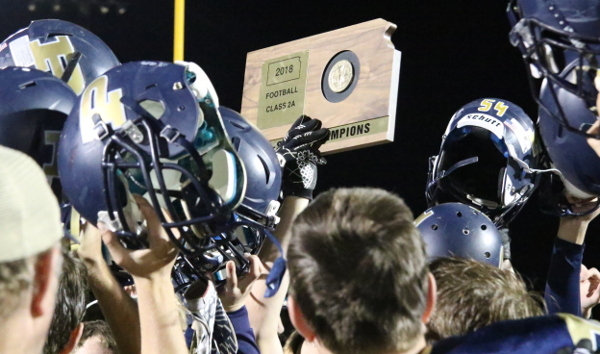 Riley County 46, Humboldt 16 – Riley County built a 25-0 lead and cruised to a 46-16 victory over Humboldt to advance to their first state title game since 1993. The Cubs pulled to within 25-8 at halftime as Conor Haviland broke a 23-yard touchdown run. But Riley County scored twice more in the third quarter on a Mikey Waggoner touchdown run and an 8-yard run by quarterback Garrett Harmison to lead 39-8. Waggoner rushed for 135 yards and five touchdowns, while Harmison added 95 yards rushing and 130 yards through the air. Humboldt finished the best season in school history with an 11-1 record. Phillipsburg 31, Hoisington 14 – Phillipsburg won 31-14 and defeated Hoisington for the second time this season at home. In Week 7, the Panthers took advantage of some early Cardinal turnovers, led 41-0 at halftime and cruised to a 51-21 victory. This time, Hoisington stopped Phillipsburg inside the Cardinal 5-yard line on the opening possession and the contest was scoreless through the first quarter. Hoisington took a 7-0 lead in the second quarter but Phillipsburg quickly tied the score on a 68-yard run from Nathan Moon. The Panthers, helped by a blocked punt from Jonathan Hunnacutt, led 17-7 at halftime. Hoisington had a long drive to start the second half and scored on a 1-yard run from Wyatt Pedigo. However, Phillipsburg quarterback Trey Sides found Treylan Gross for a 39-yard scoring pass and a 24-14 lead. Gross tacked on a four-yard TD run late. Pedigo eclipsed 2,000 rushing yards this season and had 197 yards of total offense Friday. Sides passed for 104 yards and two TDs, and Gross rushed for 89 yards. Phillipsburg moved to 12-0, and Hoisington ended the season at 9-3 and tied the furthest advancement in school history. Olpe 14, St. Mary’s Colgan 0 – The Olpe defense forced five turnovers and converted two short fields into touchdowns in beating Colgan, 14-0. After a short Colgan punt, Olpe started the scoring with a Colby Hoelting to Camden Hoelting short touchdown pass in the first quarter to lead 7-0. Colgan returned the ensuing kickoff deep into Eagle territory, but could not produce any points. Colgan then stopped a long Olpe drive on downs, but the Panthers fumbled on the next play giving Olpe another short field. The Eagles scored on a 1-yard run by Carter Cox and led 14-0 at half. Colgan drove deep into Eagle territory in the third quarter, but again couldn’t score. The Colgan offense struggled without senior quarterback Cade Simmons and senior running back Matthew Lomshek. Simmons, who finished with more than 2,000 yards of total offense, suffered a season-ending knee injury late in last week’s quarterfinal victory over Jackson Heights. Olpe advanced to the state championship game for the first time since winning it all in 2014. Smith Center 49, Plainville 7 – For the second straight year, Smith Center beat Plainville in a close regular season contest and earned a big win in sub-state. After a 21-10 regular season victory, the Redmen defeated the Cardinals, 49-7. Hesston Maxwell opened the scoring with a one-yard TD run, and Smith Center led 7-0 after the first quarter. Then, Maxwell scored again from a yard to end a 78-yard drive and give the Redmen a 14-0 lead midway through the second quarter. Smith Center quickly moved the lead to 28-0 with a 15-yard pick-six from Joel Montgomery and a 58-yard scoring run from Colby Benoit. Just before halftime, Smith Center had a 19-yard touchdown pass from Trenton Colby for a 35-0 lead. The Redmen, the defending 2-1A champions, moved 4-2 overall against the Cardinals (2-1 in sub-state) in the last three seasons. Smith Center is 11-1 with its only loss to Phillipsburg, and Plainville finished 9-3. Solomon 28, Canton-Galva 12 – Solomon advanced to the first state championship game in school history by beating Canton-Galva, 28-12. The Gorillas avenged a regular season district loss to Canton-Galva, 38-20. This time the Gorilla defense forced five turnovers in limiting Canton-Galva quarterback Landon Everett to well below his season average in total offense. Meanwhile, Solomon quarterback Braden Neilson rushed for 110 yards and his 26-yard touchdown run late in the fourth quarter extended the lead to 28-6. Jobe Fowles added 90 yards and a touchdown on the ground for the Gorillas. Hanover 60, Axtell 14 – Hanover advanced to its fifth consecutive state championship game with a 60-14 win at Axtell. This was a highly anticipated rematch of the regular-season game won by Hanover, 50-42. On Friday, Hanover scored 24 consecutive points in the second quarter to turn a 14-8 lead into a 38-8 halftime advantage. Senior Carter Bruna rushed for 103 yards and two touchdowns, while Daiken Stallbaumer added two rushing scores. Stallbaumer also passed for 167 yards and two scores to Thomas Atkins. Axtell’s record-setting season by quarterback Quinn Buessing and receiver Hunter Koch ended with Buessing passing for 215 yards and a touchdown while also adding a rushing score. For the season, Buessing passed for 2,595 yards and 51 touchdowns, while Koch had 73 catches for 1,265 yards and 33 scores. Osborne 46, Dighton 0 – Osborne rolled over Dighton, 46-0, in a home victory. The Bulldogs captured state titles in 2013 and again in ’16 in Division I. Osborne led 8-0 after the first quarter. Dighton, with just nine players, had several advancements into the Bulldog red zone but could never score. The Bulldogs led 22-0 with 3:40 left in the first half. Darnell Holloway broke a 45-yard scoring run for a 30-0 lead with 1:29 left in the first half, and 30-0 at the break. The Bulldogs moved to 38-0 with 9:57 left in the third quarter on a 27-yard scoring pass from Darnell Holloway to Kade Miller. Junior Darrien Holloway had 29 carries for 175 yards and three scores. The 11-1 Bulldogs have won 10 in a row, all by the 45-point margin. Dighton completed a memorable 9-3 season.